John Still who arrived to the then Ceylon in 1897 was one of the mostremarkable Englishmen who visited our country in modern times. He was agreat lover of Ceylon and famous for his literary works. Unlike most of hiscompatriots he foresaw that the sun could set on the British Empire. Discussing the survivals of the different periods of foreign rule he opined, “Some future observer will doubtless note that he selected for survival from among the manifold ways of the Englishmen. To hazard a prediction, I would give my vote to cricket”. A remarkable prophecy from a remarkable man remarkably fulfilled up to the hilt almost one hundred years after John Still first set foot on our shores, when Sri Lanka emerged dramatically to become the World Champions in One Day Cricket in 1996. Cricket once known as England’s national game has indeed taken route as the favourite sport in the countries which formed the “Jewel in the Crown” of her far flung Empire India, Pakistan and Sri Lanka. 1996 was christened by the world media as “Cricket’s Greatest Year” it has been the centennial year for cricket in several lands. The centenary of the Victoria Cricket Association in Australia, centenary of the Queens Park Cricket Club in Trinidad in the West Indies and the centenary of Prince of Wales’ College Inter Schools Organized Cricket. Cambrian cricket has made significant contributions in all sectors of the sport in Sri Lanka, The Schools, Clubs Mercantile, Government Services, Defence Services, Corporations and in the field of cricket administrators some of them have performed brilliantly, gained much fame and figured prominently in representative, National and International cricket. Prince and Princess of Wales’ Colleges of Moratuwa, the two prestigious and esteemed educational institutions of the island have produced men and women of calibre from time to time. It was founded by one of the illustrious sons of Moratuwa and one of the greatest philanthropists of our country Charles Henry de Soysa on 14 September 1876 and the 140th anniversary of founding of these two schools fell this year. To mark this historic event of their Alma-Mater’s the two energetic Past Pupils Associations of either schools Prince of Wales’ College Old Boys’ Association and Princess of Wales’ College Old Girls’ Union formed a Joint Committee under the presidentship of two Principals J. W. S. Siriwardena and Mrs. Malani Samarakoon and celebrated this event on a grand scale. 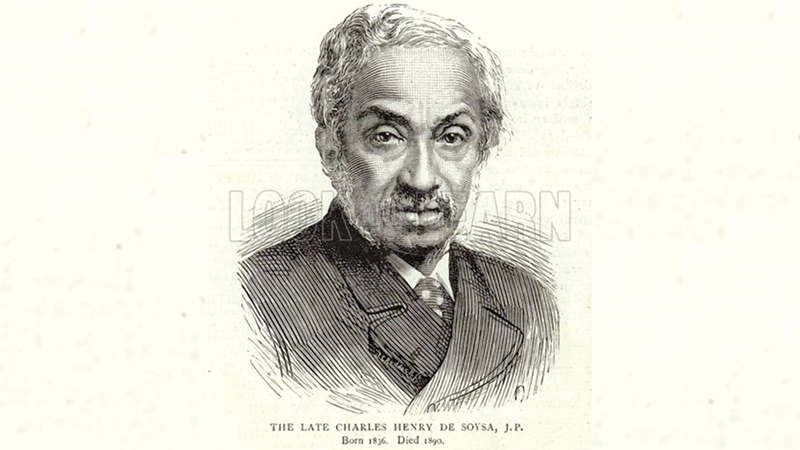 Revered Founder Charles Henry de Soysa and the cricket at Prince of Wales’ was played initially by the Masters of the College Staff and it was all friendly games. When constructing the school De Soysa did not forget to give them a play ground and a pavilion. The first pavilion was constructed where the now Prefects Room and the Cadet’s Room are functioning. In 1954 the Old Boys’ Association demolished this building and put up the existing building. Old Boys’ Association where it is presently situated. In 1987 a distinguished and a very loyal old boy and a past first eleven cricket captain H. R. Fernando donated a new pavilion. It was only after the establishment of the Prince of Wales’ College Cricket Club in 1896 by the then Principal M. J. G. C. Mendis serious Inter-School cricket began and the first ever Inter-School cricket match was played against Royal College, Colombo on 13 February 1897. The Cambrians’ first eleven cricket captain was J. G. Fernando and his opposite number was R. A. In the same year Cambrians played against Wesley College and won by an innings and 7 runs to register their first ever victory in first eleven cricket and in the next outing they lost to S. Thomas’ College, Mutwal, Colombo by 45 runs. (During this period S. Thomas College was situated at Mutwal and it was later shifted to the present venue at Mt. Lavinia.). Their Principal was J. G. C. Mendis, Master-in-Charge Claude Orr and the coach was McHeyzer. Since then cricket has blossomed at school and today it has raised upto sixteen encounters for a season (September to March) culminating with the Big Match with arch rivals St. Sebastian’s College, Moratuwa. In the early years Cambrian and Moratuwa cricketers were branded as, “Matting Wicket Cricketers” and they were debarred from selection for representative cricket. In 1996 when one of their distinguished and a very loyal old boy Lakshman Gomes was at the helm of the college with his blessings the Old Boys Association took the initiative and put up a turf wicket in addition to the existing matting wicket. Maintaining of cricket at college is not an easy task because cricket is a very expensive game. In this context the Old Boys’ Association, the Cambrian Past Cricketers Association, the Cambrian Cricket Wing, the Affiliated Old Boys Groups, the Past Cricketers, Parents are helping financially in numerous ways. Since introduction of Inter-Schools cricket in 1896 to-date thousands of cricketers from different age categories have excelled and those who have performed well deserves recognition. However this article is about Cambrian Cricket which all the past and present college cricketers will understand if there is any omission. It is with great gratitude one must remember all the former cricketers, past Principals, Members of the College Staff, the Masters-in-Charge of Cricket , Prefects of Games, Coaches, Ground Staff and all others who have laboured to keep the Purple, Gold and Maroon flag flying in the years gone by. We should especially remember the Principal who introduced cricket at college W. S. Gunawardene with the blessings of our Revered founder Charles Heny de Soysa, the founder of the College Cricket Club J. G. C. Mendis and Colossus of Cricket J. B. C. Rogrigo. Rodrigo is mainly responsible for organizing the Big Match versus St. Sebastian’s College in 1933 which has become the most popular and exiting social event at Moratuwa. Later the Limited Overs cricket match was introduced in 1981 by that cricket crazy Principal M. E. C. Fernando. In the 1890’s Old Boys played against Present Boys and when the Old Boys’ Association was formed in 1904 by J. G. C. Mendis who was at the helm of the school and first President of the OBA he introduced the Old Boys versus Present Boys annual cricket match and in 1904 and 1905 the Present Boys won and in1906 the Old Boys registered their first win. Since then this match has been an annual feature on the Old Boys’ Day. After gaining Test status the first Cambrian to captain Sri Lanka in Tests was D. S. de Silva in 1983 against New Zealand at Christchurch. He also became the first Cambrian to captain Sri Lanka in a Limited Overs Match on the same tour. The first ever International Test match for blind cricketers was between Sri Lanka and Australia played at Ratmalana and Moratuwa in 1982. Old Cambrian S. M. Benjamin captained the team and Australia won the match. Another Cambrian Norman Anthony was a member of the team and he carried away the Best Totally Blind Batsman Trophy. The establishment on Public Schools Cricket Association was formed in 1947. It was a step in the right direction and the Principal of Wesley College Rev. James Cartman was elected as the President and their Principal J. B. C. Rodrigo was the Vice President. Later Rodrigo succeeded Rev. Cartman as the President and held the post with distinction. Later the present Sri Lanka Schools Cricket Association was formed and another three Cambrian Principals M. E. C. Fernando, H. L. B. Gomes and Rohana Karunaratne held the post with distinction. One of the most outstanding Cambrian cricketers of today is young Kusal Mendis who made his mark against the Australians recently with a classice knock of 176.